Bonhams will return in March 2015 for the second time to Stuttgart for a single-marque classic car auction at the Mercedes Benz Museum. Around 40 Mercedes Benz classic cars will be on sale with the stars of the show expected to be two 1930s cabriolet: a 1931 Mercedes Benz 770 K and a 1938 Mercedes Benz 540 Kompressor Cabriolet A. Four Mercedes Benz 300 SLs, including a Gullwing, are expected to sell for over a million dollars. Cars on offer range in age from a 1900 Benz Ideal to a 2007 Mercedes Benz SLR McLaren. For the second consecutive year, Bonhams will arrange a Mercedes Benz single-marque sale in Stuttgart, Germany. The classic car auction will be held on March 28, 2015 to coincide with the Retro Classics Stuttgart – the largest annual exhibition of classic cars in Southern Germany. Around 40 classic cars will be on offer at the auction held at the Mercedes Benz Museum in Stuttgart. Top results are expected from two 1930s cabriolet while four Mercedes Benz 300 SLs from the 1950 and 1960s are also expecting to achieve good results. The oldest car on offer will be a 1900 Benz Ideal. Two large cabriolet from the 1930s are expected to achieved the highest results at the Bonhams 2015 Mercedes Benz Sale in Stuttgart. If any of these cabriolets achieve the lower estimates, it will be the most-expensive Mercedes Benz car sold thus far in 2015. A 1937 Mercedes Benz 540 Sports Cabriolet achieved a highest bid of $3.1 million (€2.75 million) at the RM Auctions 2015 Arizona sale but failed to clear the reserve margin. A 1938 Mercedes Benz 540 K Spezial Roadster Long Tail achieved a highest bid of €1.7 million at the Artcurial Paris sale in February 2015. 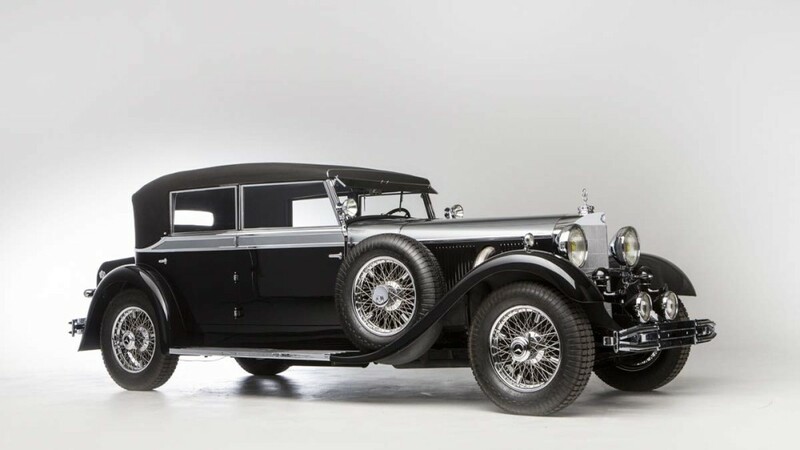 A 1931 Mercedes Benz 770 K Typ W 07 Cabriolet D has the highest pre-auction estimate for the cars on offer at the 2015 Bonhams Mercedes Benz Museum auctions in Stuttgart – €2.3 to 2.8 million. Introduced in 1930, the 770 was the largest car Mercedes Benz has ever produced up to then. Only 119 were ever produced with much of the production going to royalty – the Japanese Emperor Hirohito had seven – all armor plated. Only 18 of the four-door Cabriolet Ds with bodywork by the in house facility at Sindelfingen were ever made. The car on offer was delivered to a famous German actor, dancer and theatre/film director Erik Charell. He fled Germany in 1933 when the Nazis came to power and presumably took the Benz with to the USA. It only returned to Germany in 2004 and has since been restored to Concourse condition. The 1938 Mercedes Benz 540 Kompressor Cabriolet A at the Bonhams 2015 Mercedes Benz Auction in Stuttgart is expected to achieve €2-2.5 million. It will be the first time this classic pre-war Mercedes Benz cabriolet is offered for sale at public auction. This spectacular two-seat 1938 540 K Cabriolet is a significantly lighter variant of the original 500 K design of the 1930s. The car is restored to concourse condition and comes complete with covered spare wheel. A Mercedes Benz 300 SL seem to be a requirement for any respectable classic car auction these days and the Bonhams Mercedes Benz single-marque auction in Stuttgart is of course no exception. Four 300 SLs – three roadsters and a Gullwing – will be on offer. No fewer than 12 Mercedes Benz 300 SLs were on offer during the mid-January 2015 Scottsdale, Arizona auctions. Seven sold for over a million dollar each but four failed to clear the reserve margins. Two 300 SL Roadsters sold for over a million at the 2015 Paris auctions in early February with a further Gullwing failing to clear the reserve margin. The highest result for a 300 SL at the 2015 Mercedes Benz Sale is expected for a while 1961 Mercedes Benz 300 SL Roadster (est. €1-1.4 million). This 1962 model is an original disc-brake model and comes with an extensive service history. The original German owner had it serviced 20 times during the first four years of ownership – 300 SLs require a service every 3,000 km. An older matching numbers 1957 Mercedes Benz 300 SL Roadster with hardtop (est. €1-1.3 million) is also expected to achieve a good result. The car is in a well-maintained, part-restored condition (2+) with many items – including the red leather seats and carpets the originals. The car was originally finished in ivory but was recently resprayed in graphite grey – a popular choice for a 300 SL during the 1950s. Although much of the reputation of the 300SLs is based on the famous Gullwings, these coupes often sell for less than the more practical roadsters. The 1955 Mercedes Benz 300 SL Gullwing Coupe (est. €950,000 – € 1,250,000) on offer at the 2015 Mercedes Benz Sale is one of only 1,400 ever produced. The car was originally delivered to the USA but has been back in Europe since 2003 and in Monaco for the last two years. The brown 1960 Mercedes-Benz 300 SL Roadster (estimate €900,000-€1,200,000) originally belonged to German industrialist, Alfried Krupp von Bohlen und Halbach (1907-1967), of the Krupp steel-making dynasty. It has been in single ownership since 1980 and is in an outstandingly original and unrestored condition. It has participated in recent classic car events and with a valid registration for regular road use in Germany up to 2016. The oldest car on offer at the Bonhams 2015 sale in Stuttgart will be a 1900 Benz Ideal 41/2 HP Single Cylinder Vis-à-Vis (estimate €230,000 – 280,000). The car was originally probably delivered to the UK. The Benz Ideal is in a good restored condition and has participated often in the London to Brighton Run and other veteran car events. Cars of this age rarely appear on the auction block. Bonhams Mercedes Benz Auction will be held in Stuttgart on March 28, 2015, at the Mercedes Benz Museum. This fantastic museum on the history of the world’s oldest car manufacturer has around 200 vehicles on display. It is a 34-meter elevator ride to the top of the eight-floor museum followed by a 1.5 km walk down back to the entrance. Car enthusiasts easily cover more than 5 km to properly view all the automobiles on display. 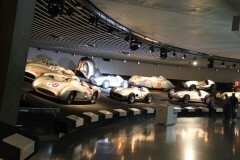 The Mercedes Benz Museum is easily reached on public transportation, or use the parking lot in the basement (complete with a few classic cars on display in glass boxes). Drivers of classic cars – not necessarily with a star on the bonnet – may often park for free at the entrance to the museum. It is also absolutely worth visiting the Porsche Museum at the opposite end of town in Stuttgart-Sindelfingen.